Downtown Hartford has a lot of parking space, and the city is forgoing tax money for it. Regardless of how hard it can seem to find a parking spot sometimes, Hartford and New Haven have built a lot more parking over the past few decades. But that can be a bad thing. Potential tax revenue that could have been collected is in the millions. A team of researchers at the University of Connecticut recently investigated the impact of parking policies in six cities across the U.S. Parking garages tend to be taxed less than other developments. The studies concluded that cities are basically forgoing tax money by requiring a certain number of parking spots with new developments. For cities like Hartford and New Haven, which have increased their parking space by a lot, potential tax revenue that could have been collected is in the millions. The researchers submitted two new studies for the Journal of the Transportation Research Board. They presented their findings earlier this year at a conference hosted by the National Academy of Science. Recently, parking authorities in Hartford and New Haven have both commissioned studies of their own to find out just how much parking is there, and to try to improve the experience. By mandating a minimal number of parking spaces with new development, and having a lower tax on parking, cities are giving developers an incentive to raze under-performing buildings and just replace them with parking lots, said Norman Garrick, associate professor of civil and environmental engineering at the University of Connecticut, and co-author of the two studies. He recalled one particular case six years ago in Hartford about “a beautiful building downtown near the train station that used to host a piano store.” Someone proposed tearing it down to build a parking lot. Cities typically don't keep track of exactly how much parking space there is, so Garrick and his team used aerial images and other sources to count the parking spots. 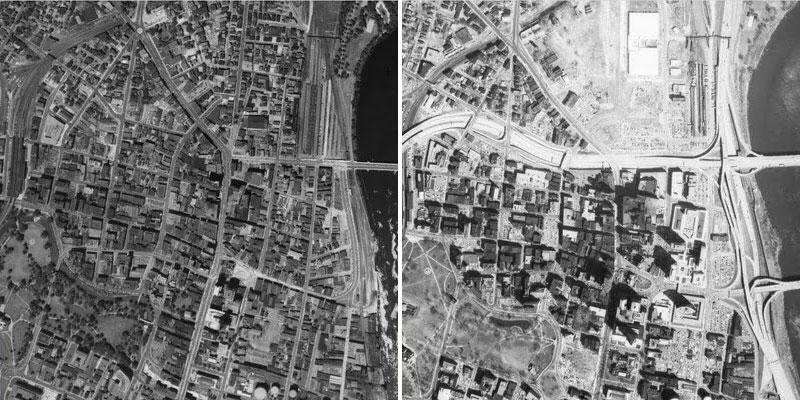 Downtown Hartford before the I-84 and I-91 interstates were built, at left, and after on the right, with more parking lots instead of buildings. To choose the cities, they wanted places that had similar populations as in the 1960s, and hadn't experienced large spikes since then. They chose Hartford, New Haven, and Lowell, Mass. as places that saw a lot more people driving; and Arlington, Virginia. 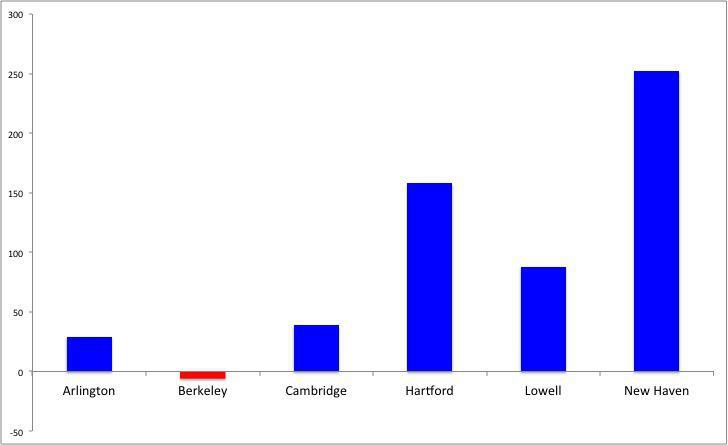 ; Berkeley, California; and Cambridge, Massachusetts as places where people drove less since the 1960s. Of those six places, Hartford and New Haven saw the largest percentage increase in the areas devoted to parking. Parking doesn't generate as much tax revenue as other developments. That means a lot of revenue that a city could have gotten if it had done something else with the land -- more than $21 million in Hartford because parking space increased by so much, and because the rest of the land is just as productive when it comes to generating taxes as land in Arlington. As for what else could be done with parking lots, Garrick pointed to Zurich, Switzerland, which settled on a “historic compromise” on parking in 1996, saying that whenever someone builds a new parking lot, they have to think about taking out existing surface parking lots and converting them into parks or plazas. As to how parking can change a city, this is what the increase in parking in downtown Hartford looks like from the 1960s to 2000, looking at the data from Garrick and his co-author Chris McCahill. Garrick pointed out he's not calling for any drastic immediate changes, just that policymakers should think about the long term implications of their actions, now that we can compare what happened to cities that built a lot more parking to cities that didn't. 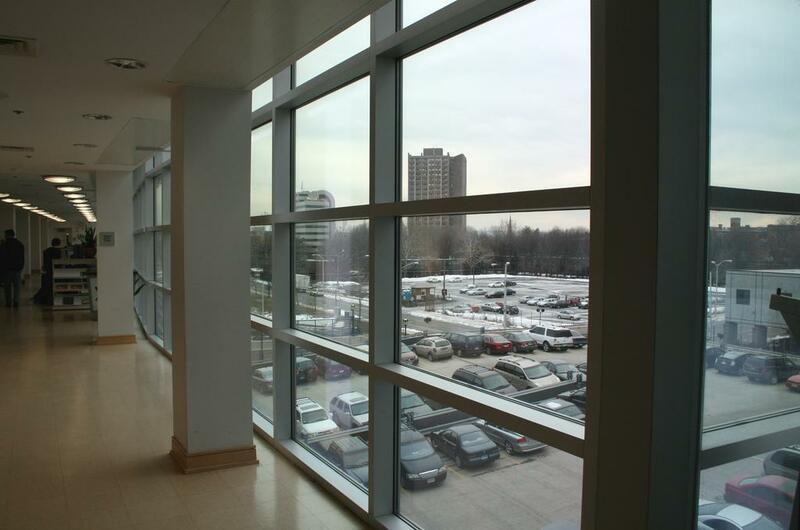 Hartford does have too much parking, but the city is working to change that. “There's a huge amount of supply, I'd say an oversupply,” said Eric Boone, chief executive officer of the Hartford Parking Authority. Hartford has eliminated the mandatory parking requirements for downtown restaurants, and buildings that get renovated or expanded, according to Thomas Deller, director of the department of development services in Hartford. Deller said just this month, the city signed a contract with Nelson\Nygaard, a transport planning firm, to study how much parking Hartford has and how to cut down on surface parking lots. Those results are expected by the end of the year. Parking in New Haven has more than doubled since the 1960s. New Haven also contracted with the same firm recently, though it has a much higher demand for parking than Hartford does, said David Panagore, acting executive director of Park New Haven. He said it's not fair to compare Hartford and New Haven with places like Arlington, Berkeley and Cambridge, because the last three are very close to booming cities with world-class universities. But in general, cities nationwide are changing the ways they think about parking. There's a brighter future ahead, and some cities already offer glimpses of it, said Donald Shoup, a professor of urban planning at the University of California Los Angeles, who studies parking policies. He pointed to San Francisco, where parking prices adjust up or down to meet demand and make sure there will always be free spots; and Pittsburgh, which is trying out a system where drivers put in their license plate number and a credit card to eliminate the need to feed the meter and save coins. 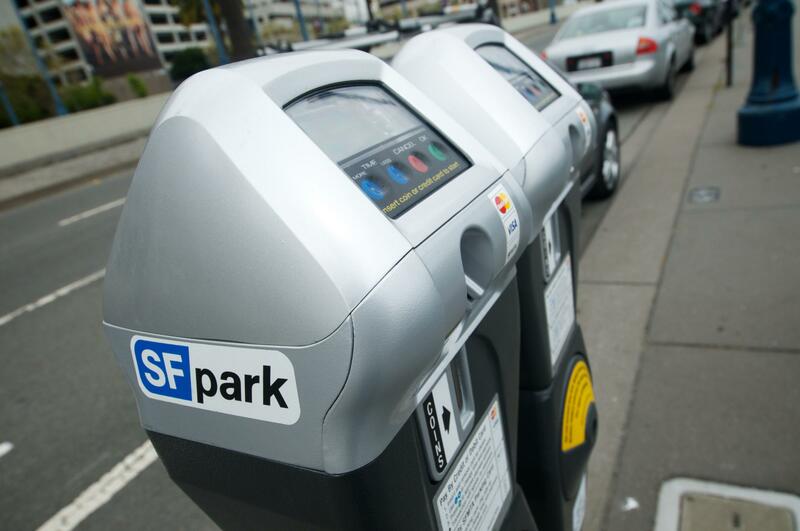 San Francisco recently introduced a new parking system where prices are adjusted to match demand. Drivers can also pay with credit or debit cards. Parking officials in New Haven and Hartford said they're watching these projects, and that the industry is changing slowly. But parking isn't as simple as one might think, said Eric Boone of the Hartford Parking Authority. "It's actually quite complex," Boone said. "There's a lot of human nature involved, as very dry and bland as, 'I have 20 parking spots, and I need to put 20 cars in' sounds." For example, some people will pay regardless of price, some people will spend time to find the cheapest spot and yet others will decide based on the weather and other factors. He pointed out the demand pricing that San Francisco and Los Angeles are trying out is similar to what the airline industry does to distinguish between customers. Some of you may actually be in moving cars right now, listening to this show, but the average automobile spends 95 percent of its life parked somewhere. Your car might be parked at work for a while, and that big employee parking lot uses up a lot of valuable space and throws off a lot of heat on summer days. Picture a parking lot....what comes to mind? A sea of asphalt, white lines, birds pecking at discarded food. Don’t forget the stray shopping carts, bright lighting at night, and blinding glare by day. Not the most pleasant place. As Americans Drive Less, What Does That Mean For Cities? A new report from the advocacy group U.S. Pirg has found that for the first time in six decades, Americans are actually driving less. 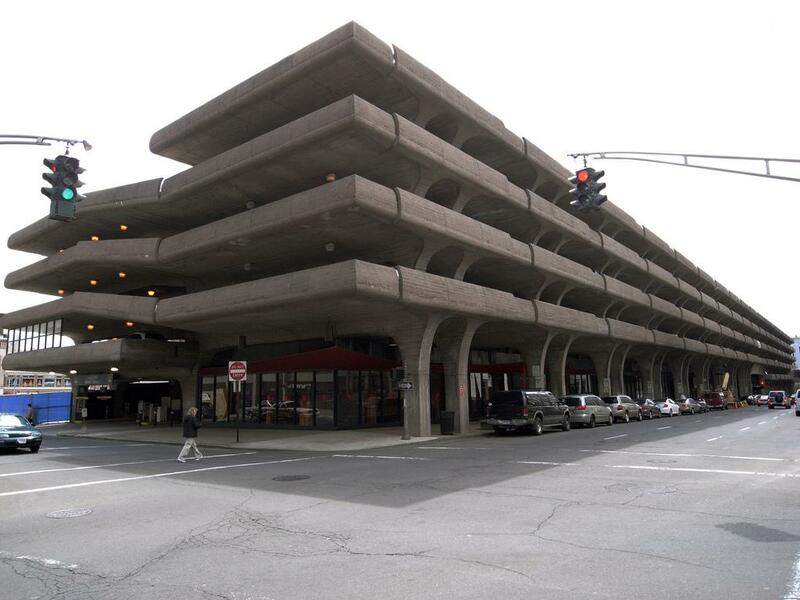 Commuters will have a chance to weigh in on state plans to rebuild a parking garage at the Stamford train station tonight. But since the names of potential developers and their plans will be kept a secret, no one’s sure what they’ll be able to weigh in on. WNPR’s Neena Satija reports.